Notes: Second season of Sailor Moon. The first arc is anime-only filler, while the second arc is loosely based on the second arc of the manga by Naoko Takeuchi, which originally ran in Kadokawa's shoujo magazine Nakayoshi from 1992 to 1997. The manga was originally available in North America from TokyoPop, though it should be noted that most of the characters' names are different, and the manga is flipped. In 2011 Kodansha Comics released a new English version that's unflipped, unedited, and uses the Japanese names of all the characters. Shortly after the defeat of the Dark Kingdom, a new enemy - two aliens named Ali and En - have come to Tokyo to absorb energy out of people to fuel their energy source, a giant tree (Makaiju). 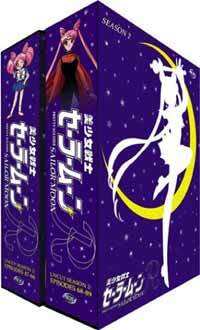 Usagi is forced to become Sailor Moon once more, and the other Sailor Soldiers are reawakened soon after. This is the first arc of the season. In the second arc, a new evil from the future - the Black Moon Clan - arrives. At the same time a little girl with long, pink hair, Chibi-Usa, arrives in Usagi's life and wedges the relationship between her and Mamoru. Mamoru himself stop seeing Usagi after he gets warnings from an unknown source to stay away from her. But why? As we all know at this point, I really like the first season of Sailor Moon. But how do I feel on season 2, Sailor Moon R? Read on and find out. For one, the art is much better than season 1. Backgrounds are more detailed, the transformation sequences have more polish (especially Sailor Moon's herself), and the coloring is more dynamic. Animation and character design-wise, it's as hit-or-miss as ever; some episodes look great (much better than season 1's best at times), and others look awful. The music has a little wider range of musical genres, including individual themes for Sailor Mercury/Mars/Jupiter/Venus when they transform. Also, unlike season one, which was mostly the Usagi Show, Ami, Rei, Makoto, and Minako are also more fleshed out, with their personalities explored quite a bit more. (Makoto's past is not a happy one.) Even Artemis gets his own episode, and Luna is still just as funny as ever (especially in the English dub). As for Sailor Moon R's story itself, we have to divide it into two parts, due to being two (almost independent) arcs. First up for discussion is the Makaiju Arc, which lasts 13 episodes. Here intergalactic aliens Ali and En are trying to steal energy for their tree using their Cardians (fancy speech for "monster of the day"), posing as brother and sister at Usagi's school. They blend in, try to fit into human culture (sometimes with amusing results, such as the conception of human food), and pretend to be nice to their own enemies they're not even aware of. Until the final three episodes of the arc it's pretty light-hearted; Ali and En are no Queen Beryl, and in their civilian forms they tend to bicker and fight a lot, occasionally even going against each other;s plans. Still, it's a nice little filler arc, but not the series' highlight. It also starts the trend of really, really goofy monsters of the day, a trend which won't die for the rest of the franchise. The rest of Sailor Moon R deals with a new evil called the Black Moon Clan. Similar to how the Dark Kingdom attacked them from their pasts, the Black Moon Clan attack Usagi and co.'s future by by traveling back to 20th century Tokyo to cause havoc. We start off with Rubeus and his four female assistants known as the vaguely goofy Spectre Sisters: Petz, Calaveras, Bertheir, and Koan. (All named after minerals, keeping up with the tradition in season one, which had its villains named after jade stones.) Rubeus is later replaced by the other members of the Black Moon Clan, most notably the goofier Esmeraude and two more competent prince brothers. Actually, goofy is a good adjective for the enemies this time around. While Queen Beryl was pretty terrifying at times, and her henchmen proved time and time again that they could kill with little remorse or sympathy when pushed, the villains in Sailor Moon R just come off as silly in comparison. The only villain who actually takes their position seriously is Wise Man, who's the flattest, most generic villain in the series' history. But a different kind of "evil" appears from the future, too; a little girl with pink hair named Chibi-Usa, who's looking for Usagi's Silver Crystal for her mother and stays at her place after brainwashing her family. Chibi-Usa herself is annoying, loud, clingy, selfish, and even unsympathetic at times, but it is eventually explained why she acts the way she does, and she does have a purpose in the season. The series actually manages to wring some legitimate sympathy by the girl, and while you may might never care for her, you'll know by the end of Sailor Moon R why Chibi-Usa did what she did, and maybe have a better understanding of her. Still, despite the series' attempt at giving Chibi-Usa character development, quite a few Sailor Moon fans still hate her. One reason I see it is that Chibi-Usa is more like a plug for the little girls at home watching the show than a strong, likable character on her own. She constantly needs to be rescued/saved, and she almost costs the Sailors' lives on a couple of occasions. She is also pigeonholed into many episodes, and it doesn't help that she serves as a major catalyst with Usagi's character in Sailor Moon R. I am, of course, talking about Mamoru's breakup with Usagi, which crushes the girl's poor heart for the good part of 17 episodes. And the show will constantly, constantly have Mamoru avoiding Usagi without telling her why he's doing so, making Mamoru come off as a gigantic jerk for no reason. Don't even get me started on the series' half-assed reasoning as to why Mamoru did this, which still gives me a migraine even after 2 whole viewings of the season. On a more positive note, Sailor Moon R has some of the most powerful scenes in the series' history. As tagged on as it is, Usagi being dumped by Mamoru leads to an emotional outburst by the poor heroine that ranks as one of the series' all-time saddest moments. A later episode, which dramatically has Rubeus kidnap Sailors Mercury, Mars, Jupiter, and Venus, and showing that Sailor Moon has little power to stop him, also shows that when the series wants to build up suspense, it can. Shortly after, Usagi even gets to the point of contemplating caving in to Rubeus, which sounds so out of character for her it gets shocked gasps from both Luna and Artemis. So at the end of the day, Sailor Moon R is a series of many emotions. Emotionally it's arguably the most over-the-map of the 5 Sailor Moon seasons; lots of funny moments, but lots of tragic/sad/dramatic bits, too. It's more focused than season one, but the spark that Junichi Sato gave the series in season one is missed with the series director changed to Kunihiko Ikuhara (who's directing is pretty tame here compared to what's to become in future seasons). With that said, it's more than a worthy follow-up to season one. And if you liked the last season, I see no reason to not continue onto this one. I was a good deal more eager to get started on R despite Tim's warnings about none of the seasons living up to the first. Aaaaaaaand I found the first half ridiculous. Our aliens gathered energy for the "Tree of Life" (shades of Yggdrasil?) by sending out "Cardians" (shades of Might & Magic?) It was my least favorite part of R, partially because most, if not all, of the Cardians started the trend of the really goofy monsters-of-the-week, but mostly because I had a bit of a problem taking the twins seriously. R still picks up in the last half, though, even if they don't completely abandon the goofy enemy concept. There's also the matter of the second season introducing us to Chibi-USA at her very brattiest. Still, they do manage to come up with the gold from time to time, often, ironically, by said moments between Usagi/Serena and Chibi-USA. Also, the show still has the courtesy of letting the other scouts do stuff from time to time, which is also appreciated.